Free BlackBerry PlayBook for DevCon attendees | BlackBerry Blast! If you're planning on attending the BlackBerry DevCon Americas 2011 in San Francisco you're in luck. You'll be receiving a free BlackBerry PlayBook. Attendees at the conference will receive a 16GB BlackBerry� PlayBook� tablet to help kick start the development of their next app! Register now so you don't miss out on this opportunity. 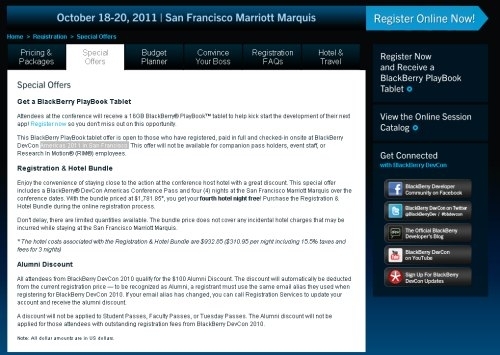 This BlackBerry PlayBook tablet offer is open to those who have registered, paid in full and checked-in onsite at BlackBerry DevCon Americas 2011 in San Francisco. This offer will not be available for companion pass holders, event staff, or Research In Motion� (RIM�) employees. 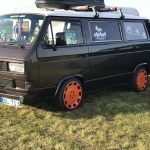 Hit the Full Story link below to sign up.